I have a private practice with two locations; my office in Kalispell, Montana and I offer equine assisted psychotherapy in nearby Whitefish. 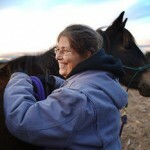 In addition to traditional talk therapy, I also offer art therapy and Equine Assisted Psychotherapy (EAP). This is a powerful and highly effective form of therapy where you will interact with horses for personal insight and behavior change. There is no riding involved, no horse experience needed. EAP facilitates a process whereby clients are able stabilize, learn to self-regulate, address and move through past or present damaging life circumstances, understand how those circumstances affect their current interactions, and make the personal changes necessary for healthy, fulfilling relationships in the present and future. I am a Artist, Counselor; Equine Assisted Psychotherapist and Art Therapist specializing in women’s issues surrounding coping with trauma and loss, domestic violence, sexual assault, grief/bereavement, divorce recovery and life transitions. With over 20 years experience in the healing arts, I began my career as a massage therapist and more recently as a counselor, equine assisted psychotherapist and art therapist. I have experience working with adolescent and adult survivors of trauma, domestic, dating and sexual violence and the sometimes maladaptive coping skills that result. I provided individual counseling and group therapy services for the domestic violence shelter, survivors of dating violence and sexual assault in our community. My education is in counseling psychology with a specialization on art therapy. My style is client-centered, holistic and strength-based. I also borrow from other clinical approaches such as Cognitive Behavioral Therapy (CBT), Dialectical Behavior Therapy (DBT), art therapy and other supportive therapies. I have additional training in Sung Nagi Kici Okiju – Becoming One with the Spirit of the Horse, which is a unique experience that honors the spirit of the horse to help people find balance. The major components of a trauma-informed approach to domestic or sexual violence will include (1) providing survivors with information about the traumatic effects of abuse or assault (2) adapting programs and services to meet survivors’ trauma-related and mental health-related needs; (3) creating opportunities for survivors to discuss their responses to trauma; (4) offering resources and referrals to survivors. A trauma-informed approach provides information about the link between lifetime trauma, sexual assault or domestic violence, and mental health. We will discuss some of the common emotional, physical and mental health effects of sexual assault and domestic violence and ways that these responses can interfere with accessing safety, processing information, or remembering details. Discussing the ways that trauma can disrupt our ability to trust and to manage feelings and can affect the ways we feel about other people, ourselves, and the world. Educating survivors about the type of things and behaviors that abusers may do to make their partners feel “crazy.” We will also provide helpful information and additional support about the ways that abusers use children, manipulate the system and mental health issues to control their partners. I specialize in helping women heal and overcome grief and trauma, assisting women in unlocking their potential and realizing their dreams by focusing on concerns particular to women; from adolescence to old age, such as body image, care taking, career and family balance, relationships, sexual abuse and self-care. Our understanding of how trauma affects the brain and human physiology has increased exponentially in the last decade. The field of neuroscience has exploded our understanding of how of depression, anxiety and trauma impact humans both as a neurological and physiological processes has led to a significant increase in holistic and alternative approaches to therapeutic interventions. Current best practices for effective treatment protocols include somatic components, or body-centered approaches, such as art therapy, equine therapy, or Eye Movement Desensitization and Reprocessing (EMDR) that address the need to release trauma from the body alongside more traditional therapy such as cognitive behavioral therapy to help the client cope with the symptoms associated with trauma and other mental health disorders. Equine Assisted Psychotherapy (EAP) is a rapidly growing field and showing significant improvements in the treatment of client’s symptoms. I specialize in working with clients suffering from trauma, recovering from sexual assault or domestic violence, as well as divorce recovery, depression and anxiety. EAP incorporates horses experientially for emotional growth and learning. It is a collaborative effort between a qualified mental health professional and a horse professional working with clients and horses to addresses treatment goals. EAP is an experiential approach to psychotherapy in which participants work one on one with horses in a variety of activities. The process includes working with horses in many different ways with the horse as your partner. As participants learn to establish trust, respect, and communicate with their equine partners they gain the skills necessary for building strong, healthy, trusting relationships in other areas of their life. This model of therapy provides a focused interactive equine experience in which emotions can be felt and processed as they happen in a safe and fun setting. The client has the opportunity to find deeper meaning and understanding of their patterns, behaviors and themes by processing the outcome of the activity with the EAP professional team. The client also has the opportunity to try out new behaviors and attitudes with immediate feedback from the horses’ behavior. Alongside talk therapy, I offer art therapy which I find PTSD sufferers to be particularly drawn to and benefit from immensely. Equine Assisted Psychotherapy offers many benefits to trauma survivors in that in involve horses, nature, movement and touch. The client can tell their story through the art making and the horse, which removes the telling of the trauma from the self, and therefore minimizes the chance of re-traumatizing the client. Each individual is trying their best each day, striving to function and feel as good as possible on any given day. Of course, we all try our best, but life comes with difficult challenges, transitions, traumas, limitations, stresses, grief and losses. This can take a variety of forms: loss of a job or relationship, a diagnosis of a chronic illness, or the inability to ignore an ever-growing feeling of hopelessness. I adapt our work together to meet the client as they are in the moment. I am able to provide sliding-scale services.